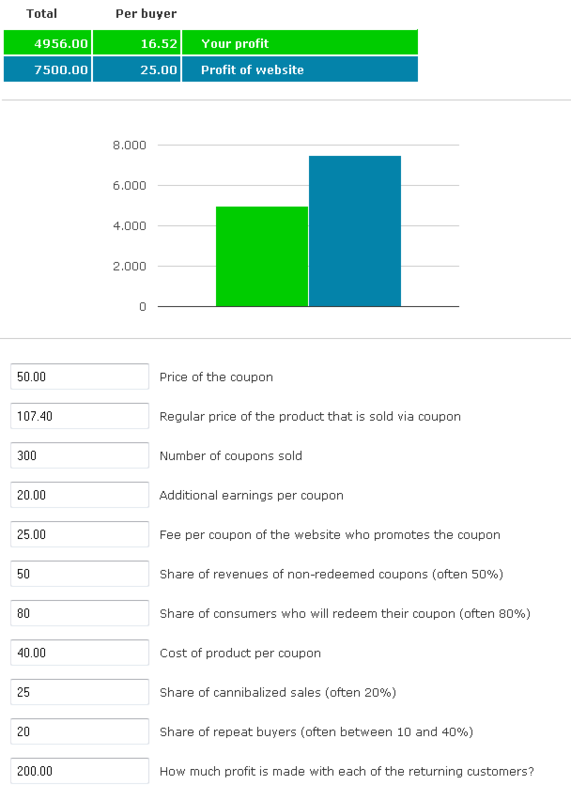 I use an example to illustrate how a restaurant could use the calculator and the results would look like: Assume that a restaurant is offering a voucher for a three-course dinner for two at a special price of € 50.00 (excluding drinks). Normally, this three-course dinner would cost € 107.40. The restaurant estimates that it will sell 300 vouchers. As the voucher does not include drinks, the restaurant assumes that it will earn on average another € 20.00 with drinks (e.g., wine, sparkling water, coffee). The restaurant needs to pay the website, for example Groupon, € 25,00 per redeemed coupon. The restaurant additionally estimates that 80% of buyers actually redeem their voucher. The restaurant estimates its cost to offer the three-course meal to be € 40.00. It also thinks that 25% of those who redeem a voucher would have come to his restaurant anyway and had actually eaten at the normal price of the three-course menu. One of five consumers who redeemed their vouchers, that is 20%, will come back again to dine in the restaurant. The restaurant estimates that it will earn another € 200,00 with each of them. The restaurant will earn € 4,956.00 with the campaign, and the website who promotes the voucher, for example Groupon, € 7,500. Thus, the promotion is profitable for the restaurant and even more profitable for the website who promotes the voucher. Please note that these values do not explicitly include tax and tip so that the values might be slightly different in reality.